Head updates lightest member of the Extreme family with some extra stability and easier access to power. Called the Graphene 360 Extreme Team, this racquet features wider string spacing and a higher swingweight than the previous generation. As a result, it not only offers above average stability and plow through for a light racquet, but it also produces impressive levels of power and spin. In addition to being light enough beginners, this stick has enough stability for the rising intermediate who wants a speedy weapon. Babolat makes big changes to the AeroPro Team, but keeps the same light weight and user-friendly playability that has made this such a great option for strong beginners, hard charging juniors and intermediate level players. This update is called the Pure Aero Team and it delivers even bigger spin and power than its predecessor. The VCORE 100 offers the most power and comfort for club players in the VCORE series, thanks to the 300g weight and 16×19 string pattern for added spin and improved manoeuvrability, stability and comfort. If your game is all about spin then this racket is one you do not want to miss ! The Pure Aero Lite is a great option for the player who wants the exceptional playability of the standard Pure Aero but in a lighter, more user-friendly package. 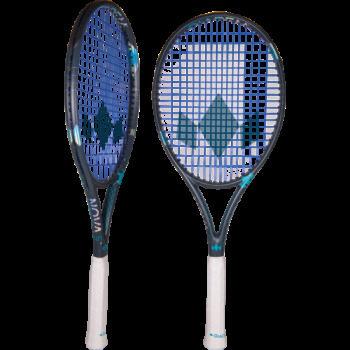 Beginner and intermediate players will appreciate this racquet's quick handling and precise delivery. It's also quite comfortable. Ultra power. Ultra spin. Wilson delivers on both promises with the new Ultra 100 Countervail. With the update comes new technologies, including Power Ribs in the throat area, Crush Zone grommets and Countervail material in the frame. In addition, the Ultra 100 Countervail's 100 square inch head size, 11.2 oz strung weight and 320 swingweight are user friendly specs for a wide range of players.